Eighty-eight per cent of Saudi business leaders who responded to a survey agree that there is an immediate shortage of highly skilled talent, while 70 per cent said that the talent deficit is either significant or acute. The Talent Shift, a new study by global organisational consulting firm Korn Ferry as part of an ongoing Future of Work Research project, included interviews with more than 1,500 CEOs and CHROs from top companies around the world, including a panel from Saudi Arabia. The focus is on getting direct executive insight into the looming talent challenges and what top companies are doing to prepare for the workforce of the future. Saudi Arabia is already experiencing the Talent Crunch — with Korn Ferry research estimating a deficit of 107,000 highly skilled professionals at 2020, a figure that could hit 663,000 by 2030. Leaders are already clear that reduced talent supply may escalate their costs. The research shows that 60 per cent of Saudi leaders fear that talent shortages may force them to increase salaries unsustainably. Yet, only 3 per cent of business leaders have a talent forecast until 2030 and a quarter don’t have a forecast at all. “With as rapidly as Artificial Intelligence and advanced technology are transforming businesses across economic sectors, executives today face a unique challenge few have dealt with before. 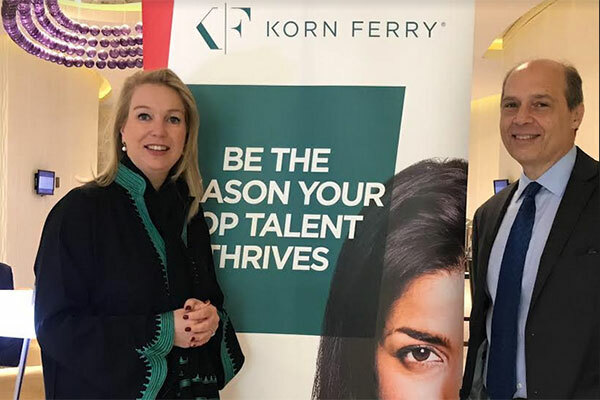 They have to plan for a future little is known about and where it is very difficult to predict the exact skills and roles companies will need to fill in the workforce of the future,” said George Karam, managing partner Korn Ferry Advisory, Middle East and Africa. Sixty per cent of Saudi executives surveyed in the Talent Shift research anticipate growing their business by at least 28 per cent by 2020 and by one third by 2030. They anticipate that growth coming with a similar corresponding increase in headcount, with 60 per cent of leaders projecting a 43 per cent increase by 2030. Left unaddressed, talent deficits could present a significant challenge that has the potential to derail these ambitious plans. 46 per cent are fearful this talent deficit will reduce profitability with 52 per cent saying it could limit growth potential in the future. The promise of technology seems to be the biggest driving force behind a lack of urgency to develop existing talent to fill the talent shortage. Over 70 per cent of Saudi leaders surveyed believe that technology (over people) will become their greatest value generator by 2030. They also believe it’s easier to plan for technology and tangible assets than it is for people, organisation and culture. Couple that with a lack of experience dealing with talent shortages is even greater among Saudi business leadership than the global average, with 60 per cent of those surveyed saying they have never had to plan for or address a talent deficit. Despite this, the ambitions of Saudi’s Vision 2030 and the National Transformation Programme, Saudi leaders are optimistic about the development of their existing young nationals. Whilst they project that 28 per cent of current jobs will become obsolete by 2030, they are also confident that 35 per cent of the current workforce is capable of being retrained and redeployed to deliver specific skills needed in the future. “Under Vision 2030 which has an ambitious transformation and nationalisation agenda, Saudi Arabia has an opportunity to tap into its vast young national population, making the region less reliant on an expat workforce,” Karam said. They plan to fill over 60 per cent of future workforce needs by development and internal promotion. Unfortunately, this confidence is not shared by all, as the second most popular strategy to attract skilled talent, as reported by 64 per cent of respondents, is to pay a salary premium. That is significantly higher than the 49 per cent global average. Saudi Arabia ranks number eight out of 20 economies in individual wage premiums for highly skilled workers, with potential individual salaries rising by $10,700 per worker by 2030, according to Korn Ferry’s Salary Surge. That’s 21 per cent higher salary impact per worker than the EMEA average. With most organisations having no real or comprehensive action plan to fill their talent pipeline for the future, over 90 per cent of Saudi business leaders are certain that they will manage to mitigate the risks of the Talent Crunch.